The number of indie games being released on Steam and consoles has sky-rocketed this last year. At the same time, the amount of money being spent on indie games doesn't really seem to increase. In other words: the average indie game is making much less money! 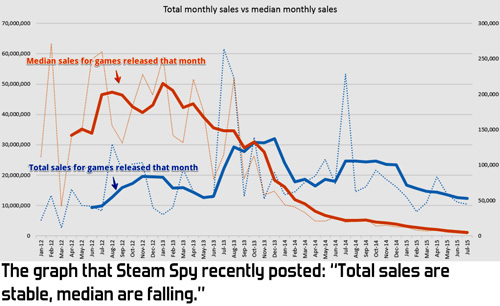 SteamSpy recently released some graphs that show that while total sales for all games together are pretty stable, median sales per game have dropped enormously. You only need to open Steam's list of new releases to see why: so many new games launching every day! Five years ago only a couple of games launched on Steam per week. Now there are dozens launching daily, and they're all competing for the same players. The average income of a new indie game has dropped so far that some even call this current trend the 'indiepocalypse'. There are several reasons we're seeing this now. The most obvious reason is that marketplaces like Steam have made worldwide distribution easy. They have become more and more open to release games, and not just the cream of the crop. Five years ago, if a hobbyist made a game he put it on Newgrounds and didn't expect to make any money. In contrast, professionally made indie games released as paid products on other platforms and thus competed with hobby developers in a less direct manner, and often in different genres. Today many smaller games can also release on Steam. If Steam keeps going in its current direction, then soon everyone will release their games there. The same goes for other platforms: ID@Xbox isn't anywhere near the speed of Steam yet, but with 21 indie games released in August alone they too are stepping up the pace enormously. Another important factor is that tools like Unity, GameMaker and Unreal make game development much easier and cheaper than it ever was. Previously many developers were confined to 2D browser games because 3D was technically too complex, as were mobile and console. Licensing a decent game engine that handled this was very expensive. Five years ago only teams with significant technical skill could make such games, yet now these engines don't require much more than the click of a button to reach most platforms. The final drop is that game dev courses are abundant now. For example, here in the Netherlands we used to have only a few schools teaching game development. Today there are dozens. I'm seeing this same kind of educational expansion everywhere in Europe. More graduates means more people to make games and many of those are starting indie companies straight out of school. Together these three factors have caused an enormous influx of people all trying to make a living making indie games. Their number is growing much faster than the market, so the average sales of indie games are dwindling. Many indie games that release today won't make much more than a few thousand dollars, far from enough to make a living as a full-time game developer. What does this mean for indie studios? I recently met a young dev who had started a company with friends and spent a lot of time making their first game. When it launched it literally sold only a few hundred copies. His conclusion? He was going to look for a job and continue making his own indie games – in his spare time, as a hobby. I think we are going to see this pattern for a lot of start-ups. There are so many games that only a few actually make a decent buck. The rest won't make enough money to sustain the company, causing those indies to bail out of trying to make a living as an indie developer. Many will become amateur indie developers instead. I don't think this dire financial situation will stop people from making games. Development is just too much fun and that small chance at success just too awesome. What if your game becomes the next Braid or Minecraft? If you can't do it professionally, I'm sure many people will just build those games as a hobbyist instead. Talented amateurs won't be able to make AAA games like the next Grand Theft Auto, but they will be able to make games similar to what indie teams of only a few people can make. A bunch of highly talented hobbyists working on a game in their spare time for a few years might be able to make the next Banished or Nuclear Throne. This is great of course, but they will be competing for the exact same audience as those trying to make a living as an indie. Full-time indies competing directly with hobbyist developers will cause the chances of indie games being a financial success to plummet even further than they already have. As the chances decrease, it will become highly infeasible to start a company and 'go pro'. Heck, it probably already has! In the long term people will realise this beforehand and most won't even try to make a living making indie games anymore. I expect they'll just get a job somewhere (hopefully still as game devs!) and keep doing their own projects on the side. Of course, some will become a hit and be able to make a living. Some others already have an audience and are really good at what they do, so those too will stick around. But in general, the vast majority of future smaller indie games will be amateur games. Is this bad? No: 'amateur' and 'hobbyist' aren't negative words. They just indicate someone who does something without making money from it. This doesn't mean they can't be good at what they do: just like there are tons of hobby musicians who are actually amazingly good, we will be seeing more and more fantastic games by talented hobby game developers. As well as a lot of bad ones of course, which is fine as long as they too are having fun making games. I expect there will also be a lot of indie games from people who have a regular job as a game developer or freelancer and make their indie games as hobby projects on the side. I've heard the current trend described as the 'indiepocalypse'. I don't think that word makes sense: this isn't an apocalypse as it isn't the end of indie. Instead it's a shift from professional indie to hobbyist indie. We'll keep seeing awesome indie games and some of those will break through to huge success. There is a big downside though: this is very sad news for those who release their first game now. Many will have started their company when the indie scene was still small enough that all decent games sold at least okay, not just the amazing ones. Many will be disappointed when their game launches and doesn't reach an audience. I can only hope they'll realise how awesome it is to have made their own full game and feel proud of having released it. But it's a bittersweet second prize, when you dreamt of making a living as an indie dev. What does this all mean for the bigger indie studios, the ones with more than ten people working on a single game? I don't know. They're capable of creating bigger, more polished productions than hobbyist developers, making those bigger games stand out from the crowd. Will this be enough for a good chance to earn back the much bigger investment? Time will tell. One thing I expect is that they will make more business deals with publishers, investors and other partners to decrease their risks and gather the required budgets. This will move those bigger indie studios further away from what is traditionally considered 'indie'. If an indie studio is successful and grows its team, it is often not considered 'indie' any more. I regularly get the question whether our own studio Ronimo is still indie: “Aren't you too big for that now?” If that's true, then 'success' often means 'not indie anymore', as using that success to grow the studio apparently isn't indie. By that definition the only successful indies are those who not only have a hit but also stay small. From a gamer's perspective I don't think any of this matters much. My favourite game this year so far is Ori And The Blind Forest. For me as a gamer it offers exactly what I look for in an indie game: it tackles a genre that AAA doesn't do (2D platformer), has a beautifully crafted atmosphere and brings a focussed experience that dares to take risks. Yet I haven't seen this game mentioned as being 'indie' at all. Apparently a type of game that I perceive as typically high-end indie isn't called 'indie' anyway. An odd part in all of this is the new breed of 'indie publishers'. Now that the overflow of indie games has made reaching a bigger audience so difficult it makes sense to look for a partner to work with: a publisher that specialises in marketing indie games. However, I remember 'indie' was originally mostly defined as 'not working with a publisher or investor'. Doesn't that make the term 'indie publisher' a contradictio in terminis? The result is that 'indie' is a word with very little meaning today. It's more marketing buzzword than anything real. Even the gigantic company EA has published games that they marketed as 'indie'. Let's piece all of this together. What do we have? The vast majority of smaller indie games doesn't make money. Hobby devs can use cheap, high quality engines to make bigger games. They can release their games on more open platforms to reach more people. And finally, the bigger games often aren't called indie. Combining this can lead to only one conclusion: in a few years the word 'indie' will mostly be interpreted as 'probably made by hobby developers'. In other words: the future of indie is amateur! An ecosystem that has a large set of hobbyists that work out of love for the craft instead of needing to make a buck? Yes please!! Historically, great inventions have come from these skunkworks. Amateurs meeting up and sharing ideas, just for the fun of it. It was the basis of the invention of the mountain bike, it is what makes dance scenes thrive, and it's the network that makes a lot of modern astronomy possible.. Check "the ProAm revolution" by Charles Leadbeater.. There seem to be a few statements being presented here without a lot of evidence. How do we know the total amount being spent on indie games has remained the same? Steam's user base has grown significantly as its catalogue has broadened, and alternative funding channels like itch.io and patreon didn't exist a few year ago. It seems much more likely that when Steam was only seeing a handful of releases a week a large paying audience was going underserved. Also, "Five years ago, if a hobbyist made a game he put it on Newgrounds and didn't expect to make any money." is simply not true. Yes, there were hobbyists putting out experimental games for free (there still are), but the bulk of the Newgrounds and wider Flash portal ecosystem was made up of games funded by sponsors and advertising. It was definitely a business. There were hundreds of one-person teams and microstudios making a living from Flash games. Before now, only the very top strata of that scene made the transition to downloadable commercial indie games (Vlambeer, Dennaton, Juicy Beast, Messhof, Team Meat, etc. ), but as Flash is slowly going away and powerful cheap/free tools (Unity, Gamemaker) continue to proliferate, more developers are jumping directly into commercial games. I think the main mistake here is assuming the gold rush conditions of early Steam/iTunes were the 'status quo'. It's a good thing that more developers have access to the market and can justify spending time improving their craft. It has never been the case (on any platform/model) that the majority of working developers can expect to achieve massive commercial success by default. "If an indie studio is successful and grows its team, it is often not considered 'indie' any more." - Why? By whom? Short of being owned by a publisher any studio can lay claim to the term. I personally understand 'indie game' to mean a game from an independently-owned developer, where control of the game's production and distribution is decided by the creator or ceded to an external party without control or ownership of the developer as a company entering into the deal. Or for short, if someone further up the chain can cancel it, it's not indie. "How do we know the total amount being spent on indie games has remained the same?" This is exactly what SteamSpy's graph shows, although only for Steam. If you want to doubt his graph then sure, but if his graph is correct then it does show that this is the case on Steam. Also, I know a LOT of recent indie releases that sold next to nothing and most were good games. So there is also the anecdotal evidence that I see this happening all around me. I think your right on a lot of these points.The word "indie" is just used as a buzzword now-a-days and doesn't really have that big of a meaning anymore. Although there are a lot of indies out right now, I would say 50 % of them were just someones hobby. I'd say most of the developers releasing indie games have separate jobs already, and if their game does take off, then they quit. It isn't the so called 'indiepocalypse' that everyone is blogging about. This is just some click bait for people to get more views on their blogs. Like you said things like Unity are making things a lot easier than they were. More games means more good ones. We may just have to sift through a lot of bad ones. I think it might be the time to either shelf the terms "Indie" and "AAA" and start looking at what it really is: a spectrum of various budgets (and thus team sizes, marketing budgets, project time, etc). Self-publishing is so easy these days that it's not really a way to differentiate game studios anymore. Some games, made in a way we currently consider "Indie", are published by big names and some self-publishing teams are larger than the team size of smaller studios under a "AAA" brand name. By looking at where in the budget spectrum a game falls we still would have limitations but it's much clearer than putting everything in one of 2 categories and calling it a day.